Prominent & Leading Manufacturer from Mehsana, we offer drummed bitumen decanting unit and bitumen drum decanter melting unit. Drummed bitumen decanting machine by Atlas is a continuous type machine for melting of bitumen that comes in drums. Many times it is not possible to get liquid bitumen at construction sites and it becomes difficult to regularly source liquid bitumen. This equipment will come handly when you want to melt bitumen that comes in drums and also intend to store the same for use in future. The heating of bitumen is by hot oil that passes from the pipelines adjoining the drums. Each unit comes with suitable storage of liquid bitumen at its bottom. A bitumen pump is also provided so that you can directly pump the liquid bitumen into waiting trucks or into another bitumen tanks. bitumen that is stored at the bottom is heated by hot oil and this process is known as indirect heating. 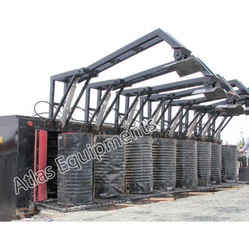 Atlas Bitumen Drum Decanter Melting Unit is available in two models. This Bitumen Drum Decanter Melting Unit is batch type. It features a chamber which uses the waste gas of the hot oil heater to heat the bitumen inside the drums. After approximately 60-70 minutes, this unit will be able to heat and melt completely the bitumen inside the drums. There is provision to store 16-17 tons / 19-20 tons of bitumen in the same chamber below. This liquid bitumen is kept hot by indirect heating. Indirect heating of bitumen prevents aeging of bitumen. Looking for Bitumen Drum Decanter Melting Unit ?